David Michael Hasselhoff (born July 17, 1952), nicknamed "The Hoff", is an American actor, singer, producer, and businessman, who set a Guinness World Record as the most watched man on TV. He first gained recognition on The Young and The Restless, playing Dr. Snapper Foster. His career continued with his leading role as Michael Knight on Knight Rider and as L.A. County Lifeguard Mitch Buchannon in the series Baywatch. Hasselhoff produced Baywatch from the 1990s until 2001 when the series ended with Baywatch Hawaii. On screen, he has appeared in films including Click, Dodgeball, The SpongeBob SquarePants Movie, and Hop. In 2000, he made his Broadway debut in the musical Jekyll & Hyde. Following his debut, he starred in other musicals including Chicago and The Producers. Hasselhoff was born in Baltimore, Maryland, the son of Dolores Therese (née Mullinex/Mullinix; died February 11, 2009), a homemaker, and Joseph Vincent Hasselhoff, a business executive. His family is Roman Catholic, and of German, Irish and English descent. His great-great-grandmother, Meta, emigrated with her family to Baltimore from Völkersen, Germany, 30 kilometres (19 mi) from Bremen, in 1865. He spent his childhood in Jacksonville, Florida, and later lived in Atlanta, Georgia, where he attended Marist High School. Hasselhoff made his theatrical debut at the age of seven in Peter Pan, and ever since his childhood dream was to have a career on Broadway. He graduated from Lyons Township High School in La Grange, Illinois in 1970. He was a member of the speech team, senior discussion leaders, president of the choir, captain of the volleyball team and held roles in several plays (including one lead role as Matt in The Fantasticks). He studied at Oakland University before graduating with a degree in theater at the California Institute of the Arts. Hasselhoff was recruited by then NBC President Brandon Tartikoff to star in the science-fiction series Knight Rider from 1982 to 1986 as Michael Knight. He has described Knight Rider as more than a TV show: "It's a phenomenon. It's bigger than Baywatch ever was." On the success of Knight Rider – "It's because it was about saving lives, not taking lives, and it was how one man really can make a difference." Hasselhoff has made several self-parodic appearances in movies. He had a major role in The SpongeBob SquarePants Movie, released November 19, 2004, starring as himself (though resembling his bygone Baywatch character) and meeting SpongeBob and Patrick (his full name is heard once in the movie; he is referred to as "Hasselhoff"). Hasselhoff also had another short appearance in the movie DodgeBall: A True Underdog Story as the dodgeball coach to the German national dodgeball team, Team Hasselhoff. Berating his team after being eliminated from a tournament, he shouts "Ihr seid alle Schweine!" (translated: "You are all pigs! ", a common German insult) and smashes a photo of himself in his Baywatch attire. In 2004's EuroTrip, Hasselhoff appears in a washroom. In the 2006 Adam Sandler film Click Hasselhoff portrays Sandler's despicable boss. Hasselhoff also appears in an episode of Wildboyz. In 2007, he again played himself in the Jamie Kennedy comedy Kickin' It Old Skool. In 2006, Hasselhoff became a co-judge on NBC's America's Got Talent, a show that showcases America's best amateur entertainers. He also judged in the second, third and fourth seasons alongside Sharon Osbourne and Piers Morgan. On the 2007 season finale, Hasselhoff sang "This is the Moment." He was replaced by comedian Howie Mandel for season five. He was a celebrity cast member on the eleventh season of Dancing with the Stars which increased in ratings by 36% from the previous year and served as a judge on NBC's America's Got Talent from 2006–09. In 2011, he joined the Britain's Got Talent judging panel, replacing Simon Cowell. In October 2010, it was announced that he would be playing Captain Hook in the New Wimbledon Theatre production of the pantomime "Peter Pan" from December 2010 to January 2011. He has reprised his role of "Hoff the Hook" for 2012 at the Manchester Opera House. In 2011, he was a guest judge at the Belgian Idols competition. 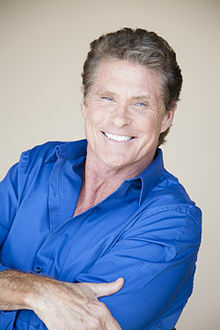 Hasselhoff became a judge on Britain's Got Talent in 2011 alongside Amanda Holden, Michael McIntyre and Simon Cowell. However, Hasselhoff was axed after only one series on the show. In 2011, he revived his music career with a short tour across Germany, Austria and Switzerland. In the same year, Hasselhoff was featured in the trailer of the spin-off downloadable game, Burnout Crash!. On February 24, 2014, he opened his own 10-week talk show in Sweden on TV3, in English. A similar show was later recorded in Finland, premiering on Sub on April 2, 2015. On May 18, 2017 Funner, California introduced its first official mayor: David Hasselhoff. Hasselhoff also starred in a cameo role in the Guardians of the Galaxy sequel, Guardians of the Galaxy Vol. 2 as himself. He additionally lent his appearance to a retro styled music video found on the film's DVD and Blu-Ray release. In 2006, fans of David Hasselhoff launched a tongue-in-cheek website "Get Hasselhoff to Number 1" in an attempt to get the 1989 hit "Looking for Freedom" to the top of the UK music charts through Internet downloads of the single. The campaign attracted attention on British radio and television broadcasts, in the national press and on the Internet. Over 40,000 people signed up to receive the "Hoff Alert" e-mail when the time had come to purchase the single. The focus of the campaign shifted to "Jump in My Car", when that was actually released as a single, and BBC Radio 1 DJ Scott Mills lent his support. On October 3, 2006, "the Hoff Alert" was sent out, and Hasselhoff promptly gained his highest ever UK chart entry (number 3) on October 8, 2006. In 2008 Hasselhoff launched a MySpace-like social networking site, known as "HoffSpace". Hasselhoff and his daughters, Taylor-Ann and Hayley, starred in a reality series on A&E called The Hasselhoffs. The series launched on December 5, 2010, and focused on Hasselhoff's attempts to resuscitate his career and launch his daughters onto the Hollywood stage. On December 10, 2010, A&E confirmed in a statement that, after airing just two episodes, The Hasselhoffs had been canceled. According to Nielsen Co. ratings, the first episode was seen by 718,000 viewers. Viewers dropped to 505,000 for the second installment, which aired on the same evening. The full series aired in the UK on May 30, 2011, on The Biography Channel. Hasselhoff stars in a casino-style game series online, produced in partnership with Eric Bischoff with Europe being among the first markets to roll out the game. In keeping with internet and online gambling culture in the UK, "The Hoff" series of games includes video slots and scratch-card type games, all played for real money in Europe's online casino environment. The first in the series of games launched on Valentine's Day in early March 2013, with media and promotional activities commencing in early February. 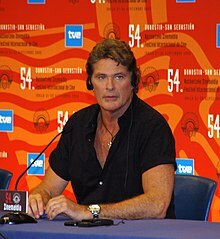 In 2014, UK channel Dave announced that it had commissioned Hoff the Record, a sitcom series in which Hasselhoff plays a fictionalized version of himself. The series started airing on June 18, 2015. In 2017 Hasselhoff appeared in short film It's No Game by director Oscar Sharp, playing "The HoffBot". Hasselhoff's lines were generated by a neural network artificial intelligence (called Benjamin) using a statistical model trained on his own 80's and 90s television performances. Hasselhoff said the A.I. "really had a handle on what's going on in my life and it was strangely emotional". Hasselhoff works as a motivational speaker . In January 2014, he spoke before hundreds of students at New College Nottingham in Nottingham, England. In April 2019, Hasselhoff spoke before thousands of attendees at TwitchCon Europe in Berlin, Germany. His music career took off in the late 1980s and achieved success at the tops of the charts, with his album Looking for Freedom which went triple platinum in Europe. He had one #1 hit in the German pop charts in spring of 1989 ("Looking for Freedom"). He was noted for his performance of the single at the Berlin Wall on New Year's Eve 1989, two months after the East German government had opened the wall, but nine months before unification took place. Wearing a piano-keyboard scarf and a leather jacket covered in motion lights, Hasselhoff stood in a bucket crane and performed the song along with the crowd. The performance has had a lasting impact on German pop-culture with Hasselhoff commenting that the song became an "anthem" and "song of hope" for the people of East Germany. In 2004, Hasselhoff lamented the lack of a photo of him in the Checkpoint Charlie Museum in Berlin. In 1993, he released the single "Pingu Dance" based on the children's show Pingu. In 1994, he was scheduled to perform a concert on pay-per-view from Atlantic City. The concert was expected to help reignite his singing career in the United States. However, on the night of the concert, O. J. Simpson was involved in a police chase in southern California. Viewership of the concert was significantly lower than expected due to the live coverage of the chase, and the event was ultimately a $1.5 million loss. In 2015, he recorded the single "True Survivor", accompanied by a music video, which featured as the lead track for the 2015 Swedish short film Kung Fury. The song was composed by Mitch Murder (Johan Bengtsson). Recorded in Sweden, the song and the video is designed as an ostentatious over-the-top 1980s homage/parody, with the video featuring dinosaurs, kung fu, Adolf Hitler, skateboarding, Norse Gods and time travelling. Hasselhoff claimed that he had received the offer to record the song and the video by a request from Sweden Universal to "sing a tribute to the '80s". Hasselhoff performed a live version of the song during the 2016 Guldbagge Awards. In 2017, a retro music video called "Guardians' Inferno" was released as a bonus on the Guardians of the Galaxy Vol. 2 home release, where Hasselhoff does the singing. Hasselhoff's autobiography Making Waves was released in the UK in September 2006. In an interview in April 2006, he said the book would present the "last chapter" regarding controversial elements of his personal life. After touring Glasgow in late 2015, Hasselhoff stated that he supports Scottish football team Partick Thistle F.C..
Hasselhoff was married to actress Catherine Hickland from March 24, 1984, to March 1, 1989. Their wedding was recreated in the Knight Rider Season 4 episode "The Scent of Roses" which first aired on January 3, 1986. Hasselhoff married actress Pamela Bach in December 1989. The couple have two daughters: Taylor Ann Hasselhoff, born May 5, 1990, who attended the University of Arizona and was cast for the 2015 season of Rich Kids of Beverly Hills, and actress Hayley Hasselhoff, born August 28, 1992. In January 2006, Hasselhoff announced he was filing for divorce, citing irreconcilable differences. Their divorce was finalized in August 2006. Bach was given custody of one daughter and Hasselhoff custody of the other, until Hasselhoff later obtained custody of both. As of December 2010[update] he resided in Southern California with his daughters. In 2012, Hasselhoff began dating Hayley Roberts, from the town of Glynneath in Wales. He is a fan of Welsh rugby union, and they regularly attend matches in Wales. He and Hayley were married at a ceremony in Italy on July 31, 2018. On May 3, 2007, a viral video surfaced online of Hasselhoff appearing to be severely drunk inside his home. His daughter, Taylor Ann, who filmed the video, can be heard interrogating him and asking him to stop abusing alcohol. She also warns her father he could be jeopardizing his spot on the Las Vegas production of The Producers he starred in at the time. In the wake of the leaked clip, Hasselhoff issued a statement saying it was recorded by Taylor Ann so that he could see how he behaved while intoxicated and the footage was deliberately released. As a result of the video, Hasselhoff's visitation rights with his two daughters were suspended on May 7, 2007, for two weeks until the video's authenticity and distributor were determined. In May 2009, Hasselhoff's attorney, Mel Goldsman, described Hasselhoff as "a recovering alcoholic". ^ a b c "David Hasselhoff Biography (1952–)". Filmreference.com. Archived from the original on March 4, 2016. Retrieved August 4, 2010. ^ "New crab with hairy chest dubbed "The Hoff"". CBS News. January 5, 2012. Retrieved January 4, 2014. ^ "Royal Wedding, Hugh Laurie and Johnny Depp lead record breakers of small and big screen in new Guinness World Records 2012 edition". September 14, 2011. Hugh Laurie has not been able to wrestle the all-time title from David Hasselhoff who remains the world's most watched man on television – ever. ^ a b Hasselhoff, David; Thompson, Peter (2007). Making waves: The autobiography. Thomas Dunne Books. ISBN 9780340909294. Retrieved January 4, 2014. ^ "David Hasselhoff sucht deutsche Verwandtschaft – Der US-Amerikaner David Hasselhoff sucht in der Nähe von Kassel nach seinen deutschen Wurzeln". Klamm.de. Retrieved May 22, 2011. ^ von der Wieden, Bianca (July 25, 2010). "SWR1 Leute überrascht David Hasselhoff mit Bremer Vorfahren" (in German). Presseportal. Retrieved December 22, 2010. ^ Heller, Corinne. "OTRC: DAVID HASSELHOFF STARRING IN 'PETER PAN' IN UK, VISITS CHILDREN'S HOSPITAL BEFORE CHRISTMAS". ABC7.com. Retrieved June 23, 2015. ^ "David Hasselhoff - Lyons Township High School". Classmates. Retrieved January 24, 2019. ^ "Notable Alumni, California Institute of the Arts". Calarts.edu. Archived from the original on January 5, 2008. Retrieved August 4, 2010. ^ Moore, Alex. "A David Hasselhoff Story You Won't Hear on TV". Retrieved September 22, 2012. ^ "9th Annual Favorite Male Performer..." People's Choice. Archived from the original on June 25, 2015. Retrieved June 24, 2015. ^ "Knight Rider Classic TV Show". NBC.com. Retrieved June 24, 2015. ^ "Catching Wave Of Popularity: 'Baywatch' Seen in 140 Countries". chicago sun times. October 28, 1994. Archived from the original on May 8, 2013. Retrieved September 22, 2012. 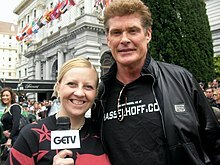 ^ "Former 'Baywatch' Hunk Hasselhoff Files for Divorce", ExtraTV.com, January 13, 2006. ^ "David 'Hoff' Hasselhoff: through the years". telegraph.co.uk. Retrieved September 19, 2016. ^ "Break Yo' TV: David Hasselhoff – "Jump In My Car"". Consequence of Sound. July 28, 2009. ^ "Hasselhoff lands Producers role". BBC News. November 3, 2006. Retrieved April 1, 2010. ^ Millett, Eddie. "Live Blog: David Hasselhoff at The Cambridge Union". The Cambridge Student. Retrieved June 23, 2015. ^ "Britain's Got Talent 2011: Michael McIntyre and David Hasselhoff join judging panel". Metro.co.uk. December 14, 2010. Retrieved May 22, 2011. ^ Love, Matthew. "Every Comedy Central Roast from Worst to Best". Rolling Stone. Retrieved June 23, 2015. ^ "Hasselhoff wins Bollywood honour". BBC NEWS. Retrieved June 23, 2015. ^ "Celebrity Interview: David Hasselhoff LIVE". ABC 7 News. Retrieved June 23, 2015. ^ "When Aleksandr Met The Hoff – Listen Now!". Compare the Meerkat. November 11, 2009. Retrieved May 22, 2011. ^ "Early day motion 1418 DAVID HASSELHOFF AND MORECAMBE WINTER GARDENS". UK Parliament Website. February 8, 2011. Retrieved June 19, 2015. ^ "Comedy Central to Roast David Hasselhoff in New Special". TVGuide.com. Retrieved May 1, 2014. ^ "David Hasselfhoff Returning to The Young and the Restless". TVGuide.com. Retrieved May 1, 2014. ^ Rice, Lynette (August 30, 2010). "Aug 30 'Dancing With the Stars': season 11 celebrity dancers list". Hollywoodinsider.ew.com. Archived from the original on November 3, 2010. Retrieved May 22, 2011. ^ "David Hasselhoff Is A Flamboyant Captain Hook In 'Peter Pan' Production". starpulse. November 29, 2010. Retrieved September 22, 2012. ^ "David As Hoff The Hook In Manchester". December 11, 2012. ^ "Idol 2011 – David Hasselhoff Interview". Archived from the original on January 4, 2014. Retrieved September 22, 2012. ^ "Hasselhoff: en svensk Talk Show". Archived from the original on October 11, 2014. Retrieved April 5, 2015. ^ "David Hasselhoff Show". Sub (in Finnish). Retrieved April 3, 2015. ^ "David Hasselhoff to Rock Berlin's Brandenburg Gate Again on Dec. 31". www.nbcnews.com. Retrieved January 1, 2015. ^ "Liveticker zu Silvester: 2015 ist da – und David Hasselhoff trotz Fehllandung auch". Tages Spiegel. Retrieved January 1, 2015. ^ "Silvester in Berlin: Party mit David Hasselhoff!". Deutsche Presse Agentur. January 1, 2015. Retrieved July 16, 2015. ^ "David To Star in New Musical "Last Night a DJ Saved My Life"". DavidHasselhoffOnline.com. Retrieved June 23, 2015. ^ "Funner, California | Only Cool Stuff. Only All The Time". Visit Funner. Retrieved February 16, 2018. ^ Admin. "Mayor Of Funner California!". David Hasselhoff. Retrieved May 22, 2017. ^ Lake, Heather. "David Hasselhoff named mayor of Funner, California". Fox 5 San Diego. Retrieved May 22, 2017. ^ Bell, Diane. "David Hasselhoff is here to put Funner on the map". The San Diego Union Tribune. Retrieved May 22, 2017. ^ "Get Hasselhoff to Number 1". Get Hasselhoff to Number 1. Retrieved January 20, 2012. ^ "Fans hassle for new Hoff pop". Metro.co.uk. June 7, 2006. Retrieved May 22, 2011. ^ "Get Hasselhoff to Number 1!!!". RWDMag.com. June 7, 2006. Archived from the original on September 18, 2006. ^ "Forum". Ynwa.tv. Archived from the original on July 15, 2006. Retrieved May 22, 2011. ^ "BBC – Radio 1 – Scott Mills". BBC.co.uk. Retrieved May 22, 2011. ^ "Thousands sign up to Hoff Space". BBC. July 3, 2008. Retrieved April 25, 2017. ^ Elser, Daniela (December 8, 2010). "David Hasselhoff's Next Chapter – Reality Star". news.com.au. Retrieved December 22, 2010. ^ "'Hasselhoffs' reality series to air on Bio". Digitalspy. May 16, 2011. Retrieved June 7, 2011. ^ "Hasselhoff: 'The Hoff' Brand Dominates My Life: Video". Bloomberg. February 8, 2013. Archived from the original on January 4, 2014. Retrieved January 4, 2014. ^ "Hoff the Record, there's a brand new commission for Dave". UKTV. June 26, 2014. Retrieved January 1, 2015. ^ "An AI wrote all of David Hasselhoff's lines in this bizarre short film". Ars Technica. ^ "David Hasselhoff booking". Retrieved April 15, 2019. ^ "David's Motivational Speech To Nottingham Students". January 14, 2014. Retrieved April 15, 2019. ^ "Twitch Talks are back for TwitchCon Europe. These are your next speakers". Twitch. Retrieved April 15, 2019. ^ "David Hasselhoff German peak positions". IFPI Germany. Retrieved November 9, 2009. ^ "Did David Hasselhoff really help end the Cold War?". BBC. February 6, 2004. Retrieved August 30, 2016. ^ "How Mr. Hasselhoff Tore Down This Wall". NPR.org. Retrieved August 30, 2016. ^ Hasselhoff, David (2006). Making Waves. Hodder & Stoughton Ltd. ISBN 9781444717372. Retrieved July 16, 2015. ^ "Oh Say Can You See the Hoff? ", TMZ.com, December 22, 2008. ^ David Hasselhoff – True Survivor (from Kung Fury). YouTube. April 16, 2015. ^ "David Hasselhoff Gives the Story Behind That Bonkers 'True Survivor' Music Video – Billboard". Billboard. ^ "De uppträder på Guldbaggegalan". aftonbladet.se. Retrieved September 19, 2016. ^ "Hasselhoff ready for Guldbaggegalan – Helsingborgs Dagblad". entertainmentbooksblog.blogspot.se. Retrieved September 19, 2016. ^ Rushton, Katherine (April 15, 2006). "Who Is the Hoff? Actor-Turned-Memoirist David Hasselhoff: "I AM SUPERMAN, and I can go ANYWHERE!"". The Book Standard. Nielsen Business Media, Inc. Archived from the original on May 25, 2007. ^ "Hoff with the Hassel! David Hasselhoff Claims He Has Changed His Name to David Hoff". People. ^ "Did David Hasselhoff Really Change His Name to David Hoff?!". Us Weekly. November 13, 2015. ^ "The Hoff: American actor explains Partick Thistle support". BBC Sport. December 23, 2015. Retrieved September 19, 2016. ^ a b Silverman, Stephen M. (January 13, 2006). "David Hasselhoff Files for Divorce". People. Retrieved May 3, 2016. ^ a b "Ex-Attorney Sues Pamela Bach". The Washington Post. Associated Press. August 24, 2007. Archived from the original on May 3, 2016. Retrieved July 22, 2012. Bach replaced [attorney Debra A]. Opri with Mark Vincent Kaplan several days after losing custody of the couple's two teenage daughters. ^ Hinckley, David (December 2, 2010). "The Hoff is no Knight Rider in A&E reality show". NY Daily News. Retrieved December 4, 2017. ^ "David Hasselhoff spotted in disguise at Wales rugby game". BBC News. Retrieved November 13, 2015. ^ Kathryn Williams (April 24, 2015). "David Hasselhoff's Welsh girlfriend Hayley Roberts on living and loving a legend". walesonline. ^ "Autumn Internationals: David Hasselhoff's advice for Wales". BBC Sport. Retrieved November 13, 2015. ^ "David Hasselhoff Details Upcoming Wedding to Hayley Roberts (Exclusive)". www.msn.com. Retrieved 2018-07-17. ^ "David Hasselhoff, 66, and Model Hayley Roberts, 38, Get Married in Italy!". www.msn.com. Retrieved 2018-08-01. ^ ""Drunk Tape Bad for Hasselhoff, but Is It Worse for His Daughter?" on ABC". Abcnews.go.com. May 4, 2007. Retrieved May 22, 2011. ^ "Hasselhoff 'too drunk' to board plane" Archived May 15, 2009, at the Wayback Machine, inthenews.co.uk, July 27, 2006. ^ "Publicist: Hasselhoff Was Sick, Not Drunk". The Washington Post. Associated Press. July 27, 2006. Retrieved June 19, 2015. ^ AP, "Hasselhoff's visitation rights suspended", USA Today, May 3, 2007; retrieved June 30, 2007. ^ Fisher, Luchina (May 5, 2009). "David Hasselhoff's Fall From A-List to Addiction". ABC News. Archived from the original on May 3, 2016. Retrieved May 3, 2016. This page was last edited on 16 April 2019, at 03:12 (UTC).